Hydraulic shock absorbers (dampers), in simple terms convert mechanical energy into thermal energy when the shock absorber fluid (hydraulic oil) is forced through orifices contained within the absorber. 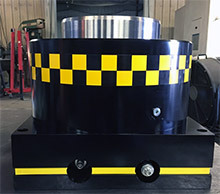 W-Technologies, Inc. builds hydraulic shock absorbers (dampers) for mechanical and hydraulic presses used in the blanking manufacturing industry. Hydraulic shock absorbers range in size from 15 ton capacity to 600 ton capacity. Each shock absorber (damper) is designed to absorb the reverse loading that occurs at the moment in time when a press builds up enough energy (tonnage) to exceed the shear strength of the material. When this material fractures it creates what is commonly referred to as "break through" or "reverse loading" of the mechanical or hydraulic press. 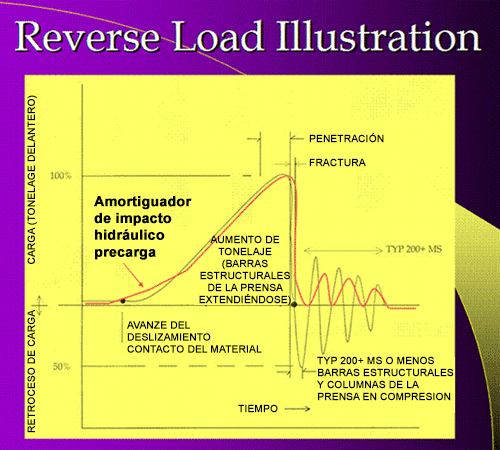 The drawing below gives some example of what this reverse loading would look like.